Swam 2km in my practice swims and 1.9km in my training session. 2.7km doesn't seem quite so far now but it still seems like a bloody long way. 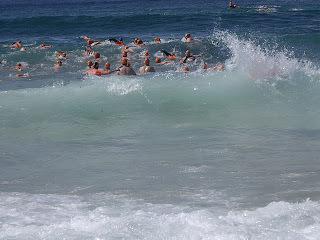 Beach session involved everyone swimming out in waves like a real race. I didn't get entirely overtaken by the fast group but I was certainly the last one in the middle group. Possibly due to hang over (5th of my life). Waves were seriously intense, we kept coming up between sets only to have to go straight back down again which meant I couldn't get my breathing right. Boo. The water was so beautiful though, sun beams came down through the water and glistened on the shifting sands. I kept getting distracted by the beauty and swimming in wiggly lines. 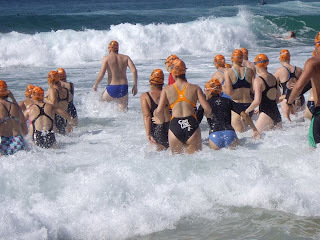 Sighting a buoy that's about 20cm high between waves is a very tricky business, so I decided to sight my fellow swimmers. This is problematic when they're not sighting themselves.